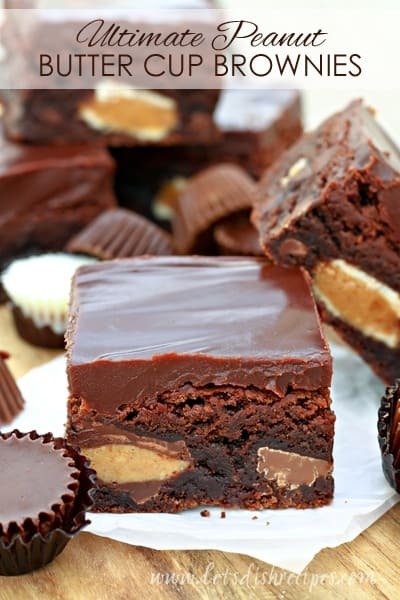 A few weeks ago, my friend Monica posted a photo on Facebook of the Ultimate Peanut Butter Cup Brownies she was making. The batter was covered in three kinds of miniature Reese’s Peanut Butter Cups! I knew she was on to something, so I just had to try it for myself. When I asked Monica for her recipe, she told me she simply used a boxed brownie mix. Which makes these decadent chocolate brownies even more brilliant, if you ask me! Boxed brownie mixes are one of my favorite time-saving shortcuts in the kitchen. 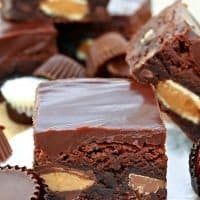 As far as I’m concerned, you really can’t go wrong stuffing your brownies with peanut butter cups (or any kind of chocolate bar for that matter). But these brownies are stuffed with milk chocolate, dark chocolate and white chocolate peanut butter cups! I don’t know if Monica frosted her brownies–I didn’t get to see the finished product. And they really don’t need frosting. But since these are the ultimate peanut butter cup brownies, I decided they needed a thick, rich layer of chocolate ganache on top. If you’ve never made chocolate ganache, don’t worry! It’s really easy! But if you have a favorite chocolate fudge frosting, that would work great too! 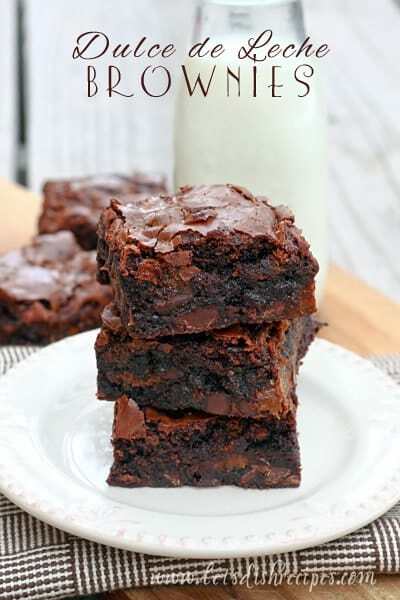 I used a Ghirardelli brownie mix in this recipe, but feel free to use your favorite brand. You can make your brownies from scratch too, if you prefer. Either way, they’ll be delicious. You’re also going to have some extra peanut butter cups, since you’ll have to buy a whole bag of each kind. But that’s never a problem at my house! Preheat oven to 350 degrees. Line a 9x9 inch baking pan with parchment paper and spray with non-stick cooking spray. Prepare brownie mix according to package directions. Spread half of the batter evenly in the prepared pan. Unwrap the peanut butter cups and press them gently into the batter. Cover evenly with the remaining batter. Bake for 25-35 minutes, or until brownies are firm. Cool completely on a wire rack. Meanwhile, make placing the chocolate chips in a medium bowl. Heat the cream over medium-low heat until bubbles just start to form around the edges. Do not let the cream boil. Pour the hot cream over the chocolate chips and let stand for 2 minutes. Whisk the chocolate and cream until shiny and smooth. Whisk in the peanut butter. Let the ganache cool until it is thick but still pourable. Pour the ganache over the cooled brownies and spread to the edges of the pan. When ganache is set, cut the brownies into squares and serve. Who Dished It Up First: This is an original recipe, inspired by my friend Monica. I am sure these brownies are rich and delicious. These look so delicious with the ganache! Did you use a brownie mix for an 8×8 pan or did you use a mix for a 9×13 which can also make an 8×8 pan? I just made these with an 8×8 mix and they don’t look as tall as yours. They taste great, tho. Thanks for the info.